Lord, today we pray for the Dallas non-profit Café Momentum, which gives young people coming out of juvenile detention a new start in life. We are thankful for the visionary, caring leadership of Chad Houser, who decided to use his skills and credentials to help others, rather than focusing solely on his own professional success. Continue to give Houser wisdom and perseverance as he trains struggling young people year after year. Bless him with an excellent staff that shares the vision of changing the trajectory of young people’s lives. We pray for the interns at Café Momentum, that they will find success at each level as they work their way through the Café Momentum program. Bless them for their choice to get involved. 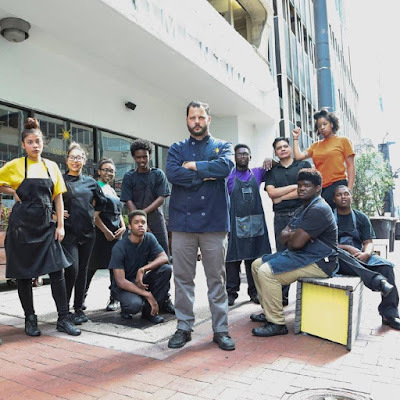 May they continue making healthy choices after they graduate from the program, and may these young adults meet needs within the culinary industry, rather than returning to any bad habits. Give them a strong desire to “pay forward” the good they have received, so this good work can be exponentially multiplied. Bring additional positive people into their lives to be lights for you. In Jesus’ name we pray, amen.